Executive office chairs are a great choice for their sophisticated looks, advanced ergonomics and adjustable features. 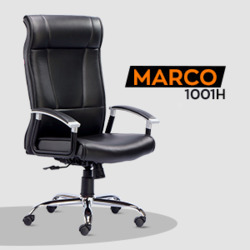 Marco 1001H executive chair comes with amazing advanced ergonomic features like Synchro mechanism with multi-position locking arrangement, Aluminum die cast arms with cushion pad, Cushion in seat and back, waterfall design seat for better thigh support. HOF executive chair online will not only keep you comfortable but will also ensure great style to your office. Order this Professional Executive Office Chair Marco 1001H online, and make way for great comfort.